Back in the early 1980’s my family lived in Angeles City, Pampanga. 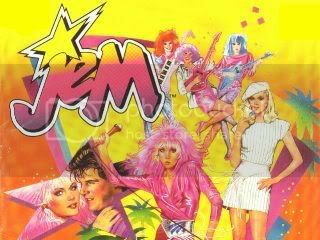 The US Air Force bases in the area aired American series on a local channel, and the cartoon series Jem was part of my staple diet of pop culture. The title character led a dual life. As Jerrica Benton, she was the CEO of Starlight Music, a record company; as Jem, she was the pink-haired lead singer of Jem and the Holograms, a pop band. The rival band, called the Misfits, played a combination of punk and glam rock. Since 80’s music was not my parents’ style and they didn’t like Madonna, my first exposure to pop music came from this cartoon. That early pattern of exposure to music through television continued and even accelerated when we moved to Metro Manila and I started watching That’s Entertainment, a locally-produced variety show where groups of young people were groomed for eventual starring roles by weekly acting and song-and-dance numbers. When my family subscribed to cable TV some years later, MTV started dictating the rhythm of my week: weekday mornings were Most Wanted request mornings, and Saturdays heralded the week’s Top 20 countdown. I tired of MTV when I went to college, but learned to download music off peer-to-peer networks like Kazaa whenever I heard a song I liked on TV shows. Currently, I’ve downloaded a lot of songs featured on Smallville, Alias, One Tree Hill, and The O.C.. I’ve even added songs from commercials to my growing mp3 collection; Lacoste and iPod commercials are both great contributors. TV has definitely influenced my exposure to and experience in music. There have been songs I didn’t like when I first heard them on the radio, but upon seeing them in the visual context provided by TV I appreciated them more. I’m more of a visual rather than an aural person, but then I suppose that’s just a symptom of my time.